The Young & the Rest of Us: Booties. The Mini Series. I love baby booties! Ok, I might have a slight obsession. This is just one photo of booties I've made. Stay tuned..... 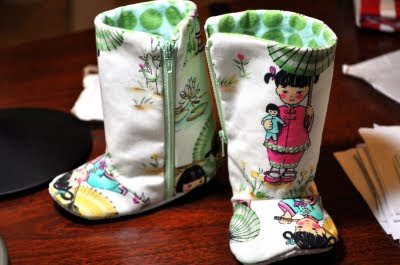 These zippered booties were made for the daughter of Caroline's friend Mary Sinatro Keany. Little Reagan Keany is an adorable toddler who is battling leukemia. Her mom is a wonderful writer and tells Reagan's inspiring story over at Caring Bridge. Oh my goodness...these are PRECIOUS!! Thanks for linking @Creative Itch's "Sew Cute Tuesday"! I'll be featuring these next week, so be sure to stop by and grab a 'featured' button!